Watch Elsa's lovely dress alight in a bewitching flurry of beautiful lights with the Disney Frozen Snow Glow Elsa Doll. With a touch of her magical snowflake necklace, you can hear Elsa talk to her Frozen friends. Raise Elsa's arm, and watch her snowflake necklace light up and play the hit song "Let it Go." Experience Frozen again and again Elsa as Elsa says 15 sounds and phrases from the movie. Featuring her signature song "Let it Go," Snow Glow Elsa creates a enchanting winter wonderland! 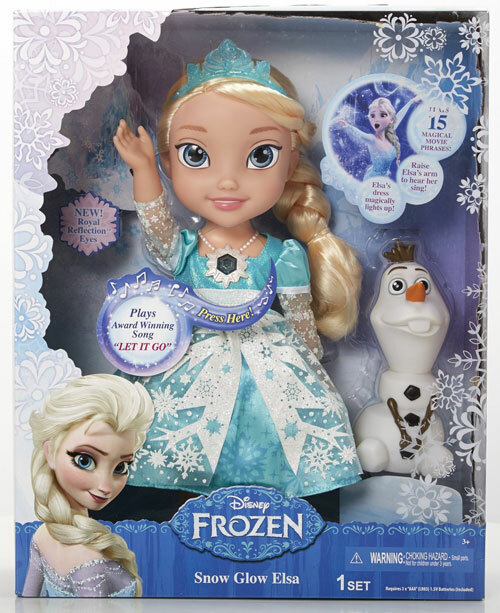 Snow Glow Elsa doll sings the hit song "Let it Go"